This book delineates the attempt, carried out by the Congregations of the Inquisition and the Index during the sixteenth and early seventeenth century, to purge various devotional texts in the Italian vernacular of heterodox beliefs and superstitious elements, while imposing a rigid uniformity in liturgical and devotional practices. 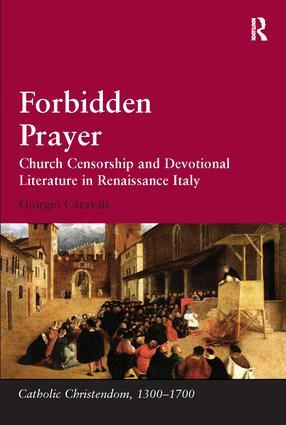 The first part of the book is focused on Rome's anxious activity toward the infiltration of Protestant ideas in vernacular treatises on prayer meant for mass consumption. It next explores how, only in the second half of the sixteenth century, once Rome's main preoccupation toward Protestant expansion had subsided, the Church could begin thinking about a move from a rejection of any consideration of the merits of interior prayer to a recovery and acceptance of mental prayer. The final section is dedicated to the primary objective of the Church's actions in purging superstitious practices which was not simply the renewal of the spiritual life of the faithful, but also the control of the religious and social life of many faithful who were uneducated. Based on a careful examination of the archival records of the two Roman dicasteri in question, many of which have only been accessible to scholars since 1998, as well as a close reading of the many of suspect devotional texts themselves, this book offers a fascinating contribution towards a fuller appreciation of the complex landscape that characterized the spiritual realities of early modern Italy. Giorgio Caravale (PhD 2000) is Tenured Assistant Professor of Early Modern European History at the University of Roma Tre. He was Lila Wallace - Reader's Digest Fellow at the Harvard University Center for Renaissance Studies in Florence, Villa I Tatti (2006-2007), Fellow at the Italian Academy for Advanced Studies at Columbia University (2009-2010) and Lauro De Bosis Lecturer in the History of Italian Civilization at Harvard University (2010-2011). He is the author of Sulle tracce dell'eresia. Ambrogio Catarino Politi (1484-1553), 2007 and Il profeta disarmato. L'eresia di Francesco Pucci nell'Europa del Cinquecento, 2011.